For other people titled 1st Duke of Somerset, see Duke of Somerset. Edward Seymour, 1st Duke of Somerset KG (c. 1500 – 22 January 1552), was Lord Protector of England during part of the Tudor period from 1547 until 1549 during the minority of his nephew, King Edward VI (1547–1553). Despite his popularity with the common people, his policies often angered the gentry and he was overthrown. He was the eldest brother of Queen Jane Seymour (d. 1537), the third wife of King Henry VIII. Portrait of Edward Seymour as 1st Earl of Hertford (cr 1537), by unknown artist, Collection of The 7th Marquess of Bath, Longleat House, Wiltshire. 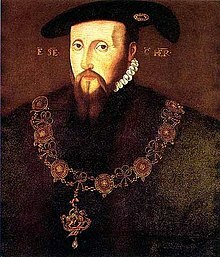 Edward Seymour was born c. 1500, the son of Sir John Seymour (1474–1536) by his wife Margery Wentworth, eldest daughter of Sir Henry Wentworth of Nettlestead, Suffolk, and descended from Edward III. In 1514, aged about 14, he received an appointment in the household of Mary Tudor, Queen of France, and was enfant d’honneur at her marriage with Louis XII. Seymour served in the duke of Suffolk's campaign in France in 1523, being knighted by the duke on the 1st of November, and accompanied Cardinal Wolsey on his embassy to France in 1527. Appointed Esquire of the Body to Henry VIII in 1529, he grew in favour with the king, who visited his manor at Elvetham in Hampshire in October 1535. When Seymour's sister, Jane, married King Henry VIII in 1536, Edward was created Viscount Beauchamp on 5 June 1536, and Earl of Hertford on 15 October 1537. He became Warden of the Scottish Marches and continued in royal favour after his sister's death on 24 October 1537. In 1541, during Henry's absence in the north, Hertford, Thomas Cranmer and Thomas Audley had the chief management of affairs in London. In September 1542 he was appointed Warden of the Scottish Marches, and a few months later Lord High Admiral, a post which he almost immediately relinquished in favour of John Dudley, the future duke of Northumberland. In March 1544 he was made lieutenant-general of the north and instructed to punish the Scots for their repudiation of the treaty of marriage between Prince Edward and the infant Mary, Queen of Scots. He landed at Leith in May, captured and pillaged Edinburgh, and returned a month later. In July 1544 he was appointed lieutenant of the realm under the queen regent during Henry's absence at Boulogne, but in August he joined the king and was present at the surrender of the town. In the autumn he was one of the commissioners sent to Flanders to keep Charles V to the terms of his treaty with England, and in January 1545 he was placed in command at Boulogne, where on the 26th he repelled an attempt of Marshal de Biez to recapture the town. In May he was once more appointed lieutenant-general in the north to avenge the Scottish victory at the Battle of Ancrum Moor; this he did by a savage foray into Scotland in September. In March 1546 he was sent back to Boulogne to supersede the earl of Surrey, whose command had not been a success; and in June he was engaged in negotiations for peace with France and for the delimitation of the English conquests. From October to the end of Henry's reign he was in attendance on the king, engaged in the struggle for predominance which was to determine the complexion of the government during the coming minority. Personal, political and religious rivalry separated him and Baron Lisle from the Howards, and Surrey's hasty temper precipitated his own ruin and that of and his father, the duke of Norfolk. They could not acquiesce in the Imperial ambassador's verdict that Hertford and Lisle were the only noblemen of fit age and capacity to carry on the government; and Surrey's attempt to secure the predominance of his family led to his own execution and to his father's imprisonment in the Tower of London. Upon the death of Henry VIII (28 January 1547), Seymour's nephew became king as Edward VI. Henry VIII's will named sixteen executors, who were to act as Edward's Council until he reached the age of 18. These executors were supplemented by twelve men "of counsail" who would assist the executors when called on. The final state of Henry VIII's will has occasioned controversy. Some historians suggest that those close to the king manipulated either him or the will itself to ensure a shareout of power to their benefit, both material and religious. In this reading, the composition of the Privy Chamber shifted towards the end of 1546 in favour of the Protestant faction. In addition, two leading conservative Privy Councillors were removed from the centre of power. Stephen Gardiner was refused access to Henry during his last months. Thomas Howard, 3rd Duke of Norfolk, found himself accused of treason; on December 24–25, he offered his vast estates to the Crown making them available for redistribution, and he spent the whole of Edward's reign in the Tower of London. Other historians have argued that Gardiner's exclusion had non-religious causes, that Norfolk was not noticeably conservative in religion, that conservatives remained on the Council, and that the radicalism of men such as Sir Anthony Denny, who controlled the dry stamp that replicated the king's signature, is debatable. Whatever the case, Henry's death was followed by a lavish hand-out of lands and honours to the new power group. The will contained an "unfulfilled gifts" clause, added at the last minute, which allowed Henry's executors to freely distribute lands and honours to themselves and the court, particularly to Seymour, who became the Lord Protector of the Realm and Governor of the King's Person, and who created himself Duke of Somerset. Henry VIII's will did not provide for the appointment of a Protector. It entrusted the government of the realm during his son's minority to a Regency Council that would rule collectively, by majority decision, with "like and equal charge". Nevertheless, a few days after Henry's death, on 4 February, the executors chose to invest almost regal power in the earl of Hertford. Thirteen out of the sixteen (the others being absent) agreed to his appointment as Protector, which they justified as their joint decision "by virtue of the authority" of Henry's will. Seymour may have done a deal with some of the executors, who almost all received hand-outs. He is known to have done so with William Paget, private secretary to Henry VIII, and to have secured the support of Sir Anthony Browne of the Privy Chamber. Hertford's appointment was in keeping with historical precedent, and his eligibility for the role was reinforced by his military successes in Scotland and France. He was senior to his ally Lisle in the peerage, and was the new king's closest relative. In March 1547, he secured letters patent from King Edward granting him the almost monarchical right to appoint members to the Privy Council himself and to consult them only when he wished. In the words of historian G. R. Elton, "from that moment his autocratic system was complete". He proceeded to rule largely by proclamation, calling on the Privy Council to do little more than rubber-stamp his decisions. Seymour's takeover of power was smooth and efficient. The imperial ambassador, Francis Van der Delft, reported that he "governs everything absolutely", with Paget operating as his secretary, though he predicted trouble from John Dudley, Viscount Lisle, who had recently been raised to Earl of Warwick in the share-out of honours. In fact, in the early weeks of his Protectorate, Seymour met opposition only from the Chancellor, Thomas Wriothesley, whom the Earldom of Southampton had evidently failed to buy off, and from his own brother. Wriothesley, a religious conservative, objected to Seymour's assumption of monarchical power over the Council. He then found himself abruptly dismissed from the chancellorship on charges of selling off some of his offices to delegates. In his first parliament, which met in November 1547, he procured the repeal of all the heresy laws and nearly all the treason laws passed since Edward III. He sought to win over the Scots by those promises of autonomy, free trade, and equal privileges with England. But the Scots were not to be won over yet, and would not be persuaded; the protector led another army into Scotland in September 1547, and won the Battle of Pinkie Cleugh on 10 September. He trusted to the garrisons he established throughout the Lowlands to wear down Scottish opposition; but their pressure was soon weakened by troubles in England and abroad, and Mary was transported to France to marry Francis II in 1557. Seymour also attempted to bring uniformity to forms of worship, and in 1549 the first Act of Uniformity introduced a Book of Common Prayer that attempted to compromise between different forms of learning; it was replaced by a more severe form in 1552 after his fall. Edward Seymour faced less manageable opposition from his younger brother Thomas, who has been described as a "worm in the bud". As King Edward's uncle, Thomas Seymour demanded the governorship of the king's person and a greater share of power. Seymour tried to buy his brother off with a barony, an appointment to the Lord Admiralship, and a seat on the Privy Council—but Thomas was bent on scheming for power. He began smuggling pocket money to King Edward, telling him that the Duke of Somerset held the purse strings too tight, making him a "beggarly king". He also urged him to throw off the Protector within two years and "bear rule as other kings do"; but Edward, schooled to defer to the Council, failed to co-operate. In April 1547, using Edward's support to circumvent his brother's opposition, Thomas Seymour secretly married Henry VIII's widow Catherine Parr, whose Protestant household included the 11-year-old Lady Jane Grey and the 13-year-old Princess Elizabeth. In summer 1548, a pregnant Catherine Parr discovered Thomas Seymour embracing Princess Elizabeth. As a result, Elizabeth was removed from Catherine Parr's household and transferred to Sir Anthony Denny's. That September, Catherine Parr died in childbirth, and Thomas Seymour promptly resumed his attentions to Elizabeth by letter, planning to marry her. Elizabeth was receptive, but, like Edward, unready to agree to anything unless permitted by the Council. In January 1549, the Council had Thomas Seymour arrested on various charges, including embezzlement at the Bristol mint. King Edward himself testified about the pocket money. Most importantly, Thomas Seymour had sought to officially receive the governorship of King Edward, as no earlier Lord Protectors, unlike Edward Seymour, had ever held both functions. Lack of clear evidence for treason ruled out a trial, so Thomas was condemned instead by an Act of Attainder and beheaded on 20 March 1549. Edward Seymour's only undoubted skill was as a soldier, which he had proved on his expeditions to Scotland and in the defence of Boulogne in 1546. From the first, his main interest as Protector was the war against Scotland. After a crushing victory at the Battle of Pinkie Cleugh in September 1547, he set up a network of garrisons in Scotland, stretching as far north as Dundee. His initial successes, however, were followed by a loss of direction, as his aim of uniting the realms through conquest became increasingly unrealistic. The Scots allied with France, who sent reinforcements for the defence of Edinburgh in 1548, while Mary, Queen of Scots, was removed to France, where she was betrothed to the dauphin. The cost of maintaining the Protector's massive armies and his permanent garrisons in Scotland also placed an unsustainable burden on the royal finances. A French attack on Boulogne in August 1549 at last forced Seymour to begin a withdrawal from Scotland. During 1548, England was subject to social unrest. After April 1549, a series of armed revolts broke out, fuelled by various religious and agrarian grievances. The two most serious rebellions, which required major military intervention to put down, were in Devon and Cornwall and in Norfolk. The first, sometimes called the Prayer Book Rebellion, arose mainly from the imposition of church services in English, and the second, led by a tradesman called Robert Kett, mainly from the encroachment of landlords on common grazing ground. A complex aspect of the social unrest was that the protestors believed they were acting legitimately against enclosing landlords with the Protector's support, convinced that the landlords were the lawbreakers. The same justification for outbreaks of unrest was voiced throughout the country, not only in Norfolk and the west. The origin of the popular view of Edward Seymour as sympathetic to the rebel cause lies partly in his series of sometimes liberal, often contradictory, proclamations. and partly in the uncoordinated activities of the commissions he sent out in 1548 and 1549 to investigate grievances about loss of tillage, encroachment of large sheep flocks on common land, and similar issues. Seymour's commissions were led by the evangelical M.P. John Hales, whose socially liberal rhetoric linked the issue of enclosure with Reformation theology and the notion of a godly commonwealth. Local groups often assumed that the findings of these commissions entitled them to act against offending landlords themselves. King Edward wrote in his Chronicle that the 1549 risings began "because certain commissions were sent down to pluck down enclosures". Whatever the popular view of the Duke of Somerset, the disastrous events of 1549 were taken as evidence of a colossal failure of government, and the Council laid the responsibility at the Protector's door. In July 1549, Paget wrote to Seymour: "Every man of the council have misliked your proceedings ... would to God, that, at the first stir you had followed the matter hotly, and caused justice to be ministered in solemn fashion to the terror of others ...". The sequence of events that led to Somerset's removal from power has often been called a coup d'état. By 1 October 1549, Somerset had been alerted that his rule faced a serious threat. He issued a proclamation calling for assistance, took possession of the king's person, and withdrew for safety to the fortified Windsor Castle, where Edward wrote, "Me thinks I am in prison". Meanwhile, a united Council published details of Somerset's government mismanagement. They made clear that the Protector's power came from them, not from Henry VIII's will. On 11 October, the Council had Somerset arrested and brought the king to Richmond. Edward summarised the charges against Somerset in his Chronicle: "ambition, vainglory, entering into rash wars in mine youth, negligent looking on Newhaven, enriching himself of my treasure, following his own opinion, and doing all by his own authority, etc." In February 1550, John Dudley, Earl of Warwick, emerged as the leader of the Council and, in effect, as Somerset's successor. Although Somerset was released from the Tower and restored to the Council in early 1550, in October 1551 he was sent to the Tower on an exaggerated charge of treason. Instead, he was executed for felony (that of seeking a change of government) in January 1552 after scheming to overthrow Dudley's regime. Edward noted his uncle's death in his Chronicle: "the duke of Somerset had his head cut off upon Tower Hill between eight and nine o'clock in the morning". Edward Seymour, Duke of Somerset was interred at St. Peter ad Vincula, Tower of London. Historians have contrasted the efficiency of Edward Seymour's takeover of power in 1547 with the subsequent ineptitude of his rule. By autumn 1549, his costly wars had lost momentum, the crown faced financial ruin, and riots and rebellions had broken out around the country. Until recent decades, Seymour's reputation with historians was high, in view of his many proclamations that appeared to back the common people against a rapacious landowning class. In the early 20th century this line was taken by the influential A. F. Pollard, to be echoed by Edward VI's 1960s biographer W. K. Jordan. A more critical approach was initiated by M. L. Bush and Dale Hoak in the mid-1970s. Since then, the first Duke of Somerset has often been portrayed as an arrogant ruler, devoid of the political and administrative skills necessary for governing the Tudor state. John Seymour (1527 – 19 December 1552), sent to the Tower of London where he died in December 1552, having survived his father by 11 months. He successfully petitioned Parliament for the restoration of his maternal inheritance, but as her lands had been sold, he was awarded compensation in the form of the estate of Maiden Bradley, an Augustinian Priory in Wiltshire granted to his father at the Dissolution of the Monasteries by King Henry VIII, which had descended to his half-siblings. However, he did not live to enjoy the grant and bequeathed it with all his other lands and goods to his younger brother Lord Edward Seymour. Lord Edward Seymour (1529–1593) of Berry Pomeroy, Devon, Sheriff of Devon. He was sent to the Tower of London in 1551 but was later released, and became heir to his elder brother, from whom he inherited Maiden Bradley, today the seat of his descendant, the present Duke of Somerset. Edward Seymour, Viscount Beauchamp of Hache (12 October 1537 – 1539), known by the courtesy title of one of his father's subsidiary titles. He died as a two-year old infant and predeceased his father. Edward Seymour, 1st Earl of Hertford (22 May 1539 – 1621), in 1559 created Earl of Hertford and Baron Beauchamp of Hatch by Queen Elizabeth I, the half-sister of King Edward VI. He married thrice: firstly in November 1560, Lady Catherine Grey, by whom he had two sons; secondly in 1582 to Frances Howard, daughter of Baron Howard of Effingham; thirdly in 1601 to Frances Prannell. Lady Anne Seymour (1538–1588), who married twice: firstly to John Dudley, 2nd Earl of Warwick; secondly to Sir Edward Unton, MP, by whom she had issue. Secondly she married Sir Henry Peyton. 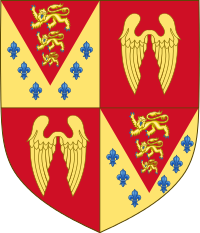 The male line of Edward Seymour and Anne Stanhope died out with the seventh Duke of Somerset in 1750, when the descendants of Edward Seymour by his first wife, Catherine Fillol, inherited the Somerset dukedom in accordance with the Private Act of 1541. However, the female line continued, and Queen Elizabeth II is descended from Somerset through his grandchild by Catherine Grey. ^ Barrett L. Beer: "Seymour, Edward, duke of Somerset (c. 1500–1552)". Oxford Dictionary of National Biography. Online edn, Jan 2009. Retrieved 21 May 2010 (subscription required). ^ a b Pollard 1911. One or more of the preceding sentences incorporates text from a publication now in the public domain: Pollard, Albert Frederick (1911). "Somerset, Edward Seymour, Duke of" . In Chisholm, Hugh (ed.). Encyclopædia Britannica. 25 (11th ed.). Cambridge University Press. pp. 386–387. ^ Starkey 2002, pp. 130–145, incorrectly dates the surrender to January 12, the date of Norfolk's final confession of treason; see also Elton 1977, pp. 330–31. In his letter offering his lands, now lost but quoted in Herbert of Cherbury, Henry the Eight (1649), 566, Norfolk asserted that he was as innocent as "the childe that was born this night", the Christ child born on Christmas Day. ^ Starkey 2002, pp. 138–39; Alford 2002, p. 69. 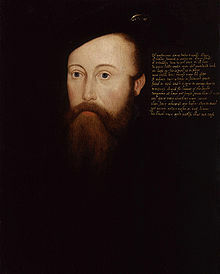 The existence of a council of executors alongside the Privy Council was rationalised in March when the two became one, incorporating the executors and most of their appointed assistants and adding Thomas Seymour, who had protested at his exclusion from power. ^ Alford 2002, pp. 49–50, 91–92; Elton 1977, p. 333. Uncles of the king had been made Protector in 1422 and 1483 during the minorities of Henry VI and Edward V (though not also Governor of the King's Person, as Hertford's brother Thomas, who coveted the role for himself, pointed out). ^ Wormald 2001, p. 62; Loach 1999, pp. 52–53. The dauphin was the future Francis II of France, son of Henry II of France. ^ Elton 1977, p. 333n; Alford 2002, p. 65. ^ a b "Seymour, Edward (1506?-1552)" . Dictionary of National Biography. London: Smith, Elder & Co. 1885–1900. ^ "ROGERS, Andrew (died c. 1599), of Bryanston, Dorset. – History of Parliament Online". Retrieved 31 August 2016. ^ a b "ROGERS, Richard (c. 1527–1605), of Bryanston, Dorset. – History of Parliament Online". Retrieved 31 August 2016. Brigden, Susan (2000), New Worlds, Lost Worlds: The Rule of the Tudors, 1485–1603, London: Allen Lane/Penguin, ISBN 0-7139-9067-8 . Dickens, A. G. (1967), The English Reformation, London: Fontana, ISBN 0-00-686115-6 . Elton, G. R. (1977), Reform and Reformation, London: Edward Arnold, ISBN 0-7131-5953-7 . Loach, Jennifer (1999), Bernard, George; Williams, Penry (eds. ), Edward VI, New Haven, CT: Yale University Press, ISBN 0-300-07992-3 . Starkey, David (2002), The Reign of Henry VIII, London: Vintage, ISBN 0-09-944510-7 . Wormald, Jenny (2001), Mary, Queen of Scots: Politics, Passion and a Kingdom Lost, London: Tauris Parke, ISBN 1-86064-588-7 .